3.5 oz bag of black and orange Colorific chocolate candy bites, 8 oz bag of foil wrapped chocolate candy pumpkin balls, clear box with 4 foil wrapped homemade peanut butter cups confections, 1 foil wrapped solid chocolate candy acorn, and 1 solid white chocolate candy ghost on a stick. 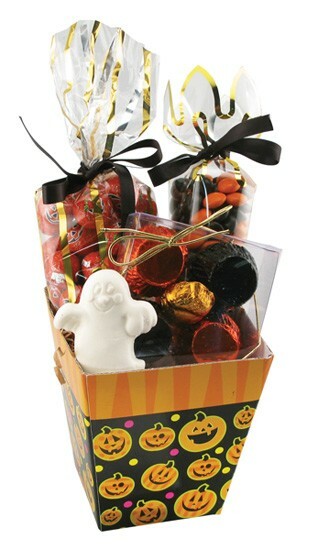 Packaged in cardboard pumpkin box gift basket. Wrapped in cello and tied with black raffia ribbon. Price includes 4 color label on the box. Makes a great food gift or holiday gift.